From small earthen ponds and dugouts to miles of irrigation canals, it’s the most cost effective solution to your water loss problems. Can be used safely with some fish species contact us prior to using with fish to verify. Contact us prior to applying product to be sure of recommended procedure in the presence of important fish. Ponds should be clay or earth ponds and over 4' deep. *Contact us by email regarding your project, prior to ordering, if you have questions or are concerned about impact on your fish. For Soilfloc to penetrate and seal a leak it requires 3.5 to 4 feet of head pressure. This hydrostatic pressure is what draws the Soilfloc into the leak and seals it. It is not designed to seal leaks in lined ponds although some exceptions apply. Email us with any questions on small ponds or lined ponds or shallow ponds. For larger clay bottom or earthen dugouts there are fewer concerns beyond applying at the correct dosage. Soilfloc® Sealant is the product of choice to plug leaks in fire ponds, irrigation ditches, cattle ranch watering holes, residential ponds, dugouts and large clay ponds and more. No need to drain water. 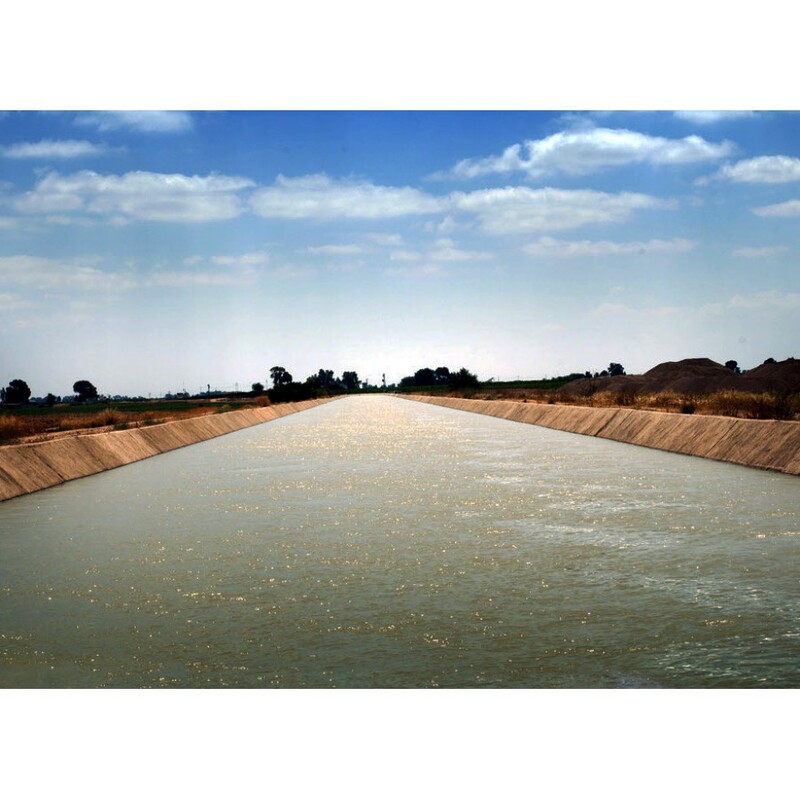 Soilfloc® shoud be applied when the ditch, pond, or canal has water in it & is currently leaking as the leak in the dam or basin creates a natural suction that will draw the Solifloc polymers into the problem areas & seal the leak or leaks. If you know where the leak is can concentrate the application in that area, but it is strongly recommended that the rest pond, canal or basin be treated as well to provide a consistant seal. This also helps if soil consistancy could lead to future leaks. Application is best done when the pondwater level is at least above the problem area and to the full basin volume of possible. Ponds should be clay or earth ponds over 4' deep. Soilfloc pond sealant comes in two parts that work together synergystically. 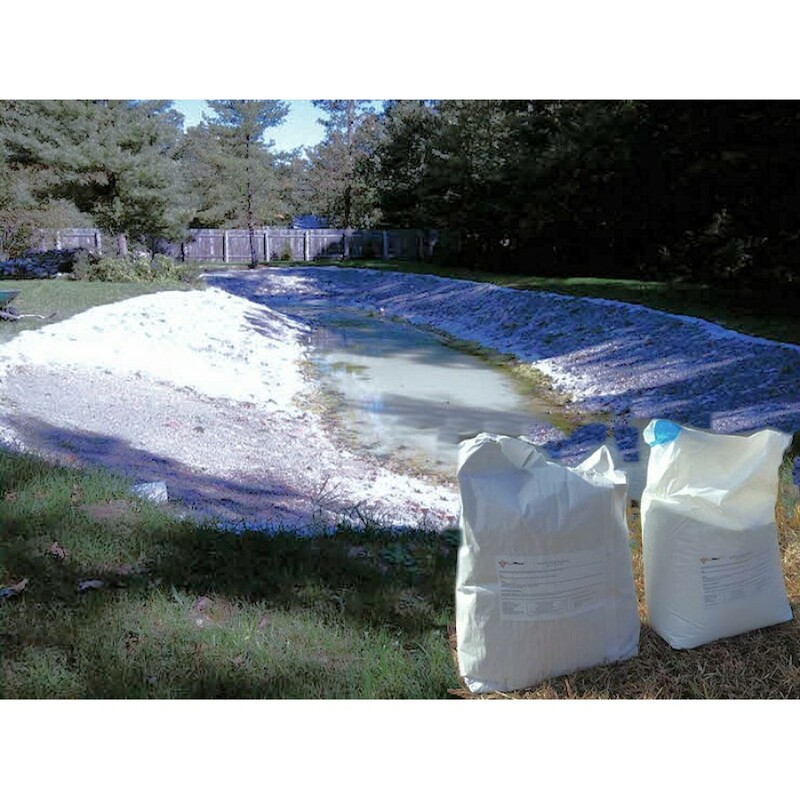 Every Soilfloc order comes in two parts with a Part 'A' which is a fine powder and Part 'B' which are small granules and these two compounds (Part A & Part B) are added at a rate of approximately 1 pound of Part A and 1 pound of Part B per 32 to 45 square feet of pond surface area being treated, depending on the leak and soil type. The 55 lb supply comes with 27.5 lb of part A and a 27.5 lb of Part B. The 110 lb supply comes with 55 lbs of Part A and 55 lbs of Part B. etc, etc. 55 Pound Supply will seal a pond surface area of 1750 - 2500 sq/ft depending on the leak. 110 Pound Supply will seal a pond surface area of 3500 - 5000 sq/ft depending on the leak. A 1/4 acre pond would require from 250 lbs to 330 lbs depending on the leak. A 1 acre pond would require from 990 lbs to 1320 lbs depending on the leak. **Do not under apply. Contact us prior to applying product to be sure of recommended procedure in the presence of fish. Ponds should be clay or earth ponds and over 4' deep. Product is simply sprinkled over the surface of the water. The water should not be moving and there should be no wind or rain. Distribute it as if you are 'feeding the chickens' at the recommended rates. Cast out gently no more than 5' by hand, scoop or fertilizer spreader from a small dingy. During application Part A and Part B must be applied in rapid succession, first part A and then Part B as soon as possible. For a slow leak apply at the rate of 3 ounces per 11 sq ft (1.5 ounces of Soilfloc® Sealant part A and 1.5 ounces of Soilfloc® Sealant part B). For a fast leak, use 3.5 - 4 oz. per 11 sq. ft. Apply Soilfloc® Sealant Part A to the approx 11 sq. ft. section first, and then immediately add the Soilfloc® Sealant Part B on top of Part A, before moving to the next section. Remove any deep silt, livestock, dense reeds or heavy vegetation, as they can impede the polymers ability to get to the outflows. 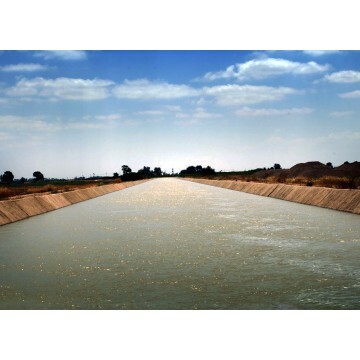 Soilfloc® Sealant is a polymer based, Earthen Pond Sealant. Polymers make up many of the materials in living organisms, including proteins; they are natural or synthetic substances composed of very large molecules (macromolecules). Soilfloc® Sealant is an Anionic Polyacrylamide polymer, also known as PAM. Soilfloc® Sealant comes standard in Part-A and Part-B either 26.5 lbs each or 55 lbs each depending on the format. The two parts are mixed on-site as shown in the video. Photo showing another two 55 pound bags of Soilfloc ready to be applied. The most cost-effective pond sealant in the USA. PAM is a synthetic (man-made), potassium or sodium based, long-chain polymer (same molecule repeating itself many times) designed to attract either positively charged particles or negatively charged particles. How does Soilfloc® Sealant work? Soilfloc® Sealant is a combination of synthetic, anionic PAM's, that both flocculate and hydrate, to plug leaks and stop water loss. 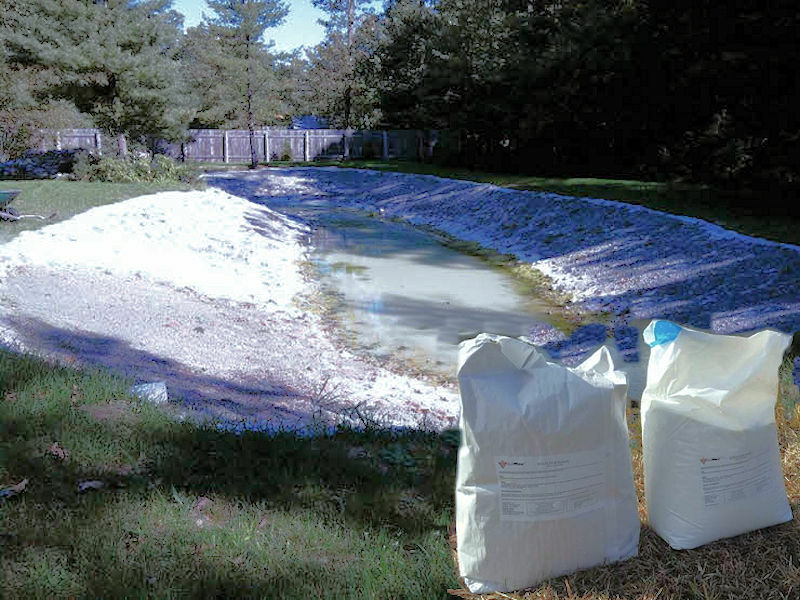 There is no need to empty your pond, Soilfloc® Sealant works best when it's full. It's designed to locate leaks by following water as it's pulled into the cracks and crevices by the draw of the leak. For best results, we recommend you use our product on ponds that are at least 4', unless the product is applied during construction in a dry pond*. In the case of small backyard decorative ponds, we've had customers achieve positive results, however, the product is not designed to work in shallow environments. In small ponds with fish or in any pond with fish it is recommended to remove fish prior to treatment especially if they are prized fish or very important fish. What can I expect during application? 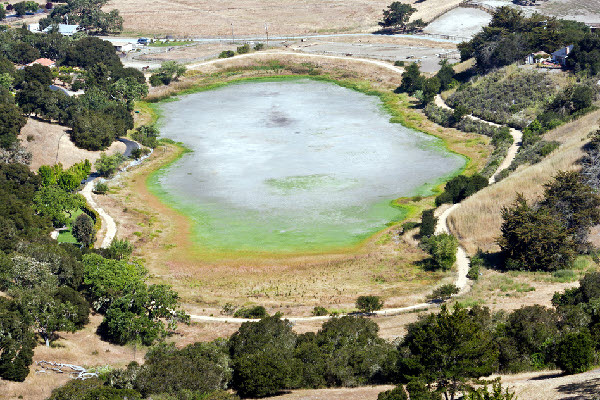 Soilfloc® Sealant is a highly effective solution to leaking ponds. However, it's not a miracle and it has to be applied to work. Product application does require some patience. When applied as directed it gives the pond owner a fighting chance against leaks that normally would not be fixed without reconstruction or expensive pond liners. Please follow the application instructions, as written, for best results. But due to the ingenuity of many of our customers, we've heard of people trying different application methods, without changing the dosages as prescribed on our instruction sheet. Always review the SDS prior to working with Soilfloc® Sealant. SOME Soilfloc® Sealant part B will float; this happens -it doesn't mean there is anything wrong with your product! This is especially true if you have a pond with large cracks and crevices and have custom ordered larger sized crystals to seal your leaks. Because they take longer to swell, they may not sink before swelling. If you do have floaters, you can collect them, let them dry out and reapply or you can discard them. You may also see these polymer crystals at at the bottom of your pond for a while following application, they'll eventually become part of the soil matrix. There is NO magic pond sealant and despite claims, this is not magic pixie dust. It's science and it's an effective tool to seal stubborn leaks. Our 40+ year reputation speaks for the success of this product. We've had the honor of sealing thousands of leaks for many happy customers. That said, it's not going to compensate for poor pond construction. Yet even the most renowned pond builders have been baffled by a leaking pond and have come to rely on our product to solve their problem. As with anything, polymers have limitations. We don't do the application, so we don't warranty the work. We do stand by the product quality and only ship product that meets our strict product specifications. *Contact us by email regarding your project, prior to ordering, if you have questions.